"The Sounds of New Horizons"
What does New Horizons say when it calls home? 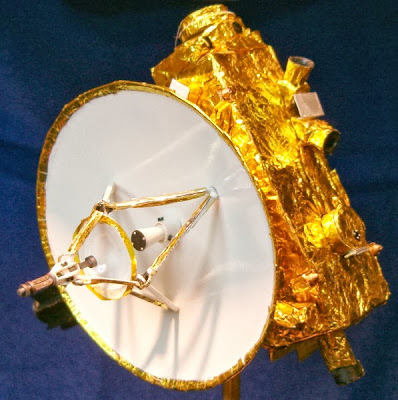 Nothing, without the help of software that transforms zeros and ones from New Horizons’ computers into images, instrument readings, or useful information on the spacecraft’s status. Those datasets are then transmitted to Earth by the telecommunications (radio) system aboard New Horizons. But if our Pluto-bound spacecraft could talk, it would sound something like the “tune” members of the New Horizons communications team created from actual ranging signals that New Horizons traded with NASA Deep Space Network (DSN) receiving stations earlier this year. The New Horizons team uses these ranging measurements to determine the spacecraft’s orbit, or its precise location in space. The DSN station modulates a ranging code and transmits it to the spacecraft, which demodulates the code (essentially processing the signal to receive the data) and transmits back to Earth. The DSN station then measures the round-trip time delay – in seconds – between transmission and reception of the ranging code. The measurement allows the team to determine the time needed for a signal to travel between the DSN station and the spacecraft. "The ranging signal is a special sequence of tones sent to the spacecraft and turned around, or transmitted back,” says Chris DeBoy, New Horizons telecommunications system lead engineer from the Johns Hopkins Applied Physics Laboratory in Laurel, Md. “You're hearing those tones as they're received back at Earth, but converted down to a frequency range that the human ear can hear. The ranging technique is just like seeing how much time it takes to hear the echo of your voice reflected off some object to measure how far away you are. Except in this case, the DSN's ‘voice’ is a million or more times higher in frequency than your voice, travels almost a million times faster than the speed of sound, and the round-trip distance is more than 4 billion miles!" These signals were sent to New Horizons on June 29, 2012, from the DSN station in Goldstone, Calif., and returned to the station in Canberra, Australia. Traveling at the speed of light, the signals made the round trip in six hours, 14 minutes and 29 seconds. Today, New Horizons is 2.6 billion miles from Earth, between the orbits of Uranus and Neptune, speeding 33,200 miles per hour toward a July 2015 encounter with Pluto and its moons.